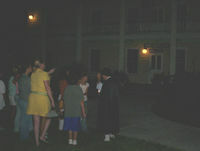 Join this Fort Lauderdale ghost tour - it's the area's most popular walking tour. Hear tales of the city's spookier side, hauntings and intriguing mysteries - The Haunted Hotel, The Waiting Bride, The Ghost Train, Mysteries of the Bermuda Triangle and more. Take a lantern-led, evening Ghost Tour along the banks of the New River with Fort Lauderdale's most popular walking tour. Discover the hauntings, mystery and history of Fort Lauderdale's dark past with Fort Lauderdale's Original Cape and Lantern Ghost Tour. Who's the bride in the Haunted Hotel? What heart-crushing disappointment brought her there? Which Riverside restaurant has a haunted dining room? What sorrow brought the ghosts of Indian children to the New River? Has the Ghost of one of Fort Lauderdale's early important citizens risen from his watery grave? From the mystery of the Bermuda Triangle to Indian Massacres and Spirits Trapped in Time, discover it all on the Fort Lauderdale Ghost, Mysteries and Legends Tour along the Historic and Haunted Las Olas River Walk. Return details: Tour returns to the original departure point Hotel Pickup: Hotel pick-up is not available for this tour.